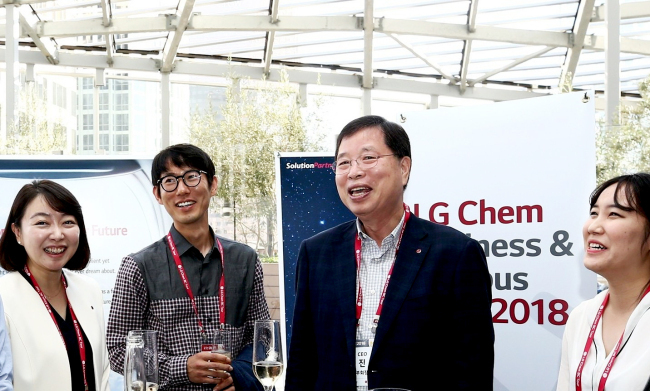 LG Chem, the chemicals and biopharma business unit of South Korea’s fourth-largest conglomerate LG Group, said Sunday that its management executives including Vice Chairman and CEO Park Jin-soo visited Los Angeles to recruit talent from around the globe. Every year since taking office in 2012, Park has participated in the company’s global recruiting event, which takes places in such countries as the US, Japan, China, according to LG Chem. The recruiting event “Business & Campus,” held at Intercontinental Hotel in Los Angles over the weekend, was attended by some 40 students with degrees from 30 major universities in the US including Stanford University and Duke University. achievement was attributable to our employees’ passion for their jobs and aspiration for the best,” Park said during the event. The CEO’s participation in the recruiting process reflects his belief that quality employees constitute the core of sustainable growth, according to the company.